Wednesday, May 10, 2017 | 9:00 a.m. – 3:00 p.m. 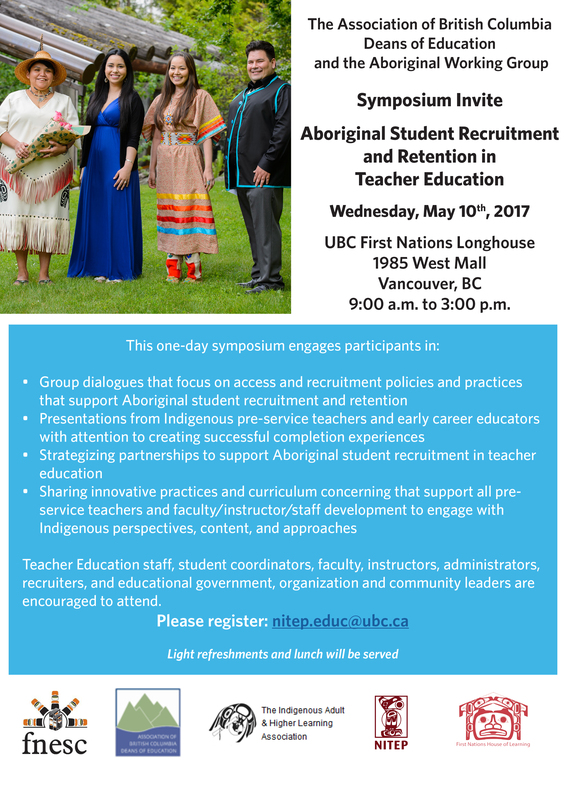 The Association of British Columbia Deans of Education (ABCDE) and the Aboriginal Working Group invite you to attend a symposium on Aboriginal Student Recruitment and Retention in Teacher Education. Group dialogues that focus on access and recruitment policies and practices that support Aboriginal student recruitment and retention. Presentations from Indigenous pre-service teachers and early career educators with attention to creating successful completion experiences. Strategizing partnerships to support Aboriginal student recruitment in teacher education. Sharing innovative practices and curriculum concerning that support all pre-service teachers and faculty/instructor/staff development to engage with Indigenous perspectives, content, and approaches. Teacher education staff, student coordinators, faculty, instructors, administrators, recruiters, and educational government, organization and community leaders are encouraged to attend. Several private suites at the new Ponderosa Commons building are on hold for ABCDE Symposium and 2017 Roundtable attendees. Book a suite on the official Roundtable accommodations page. The closest parkade is the Fraser River Parkade (6440 Memorial Road). 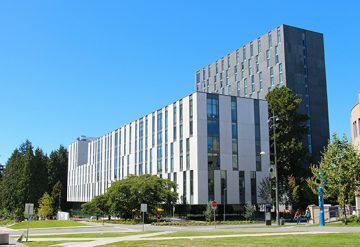 As well as parkades, UBC has numerous parking lots located throughout campus. 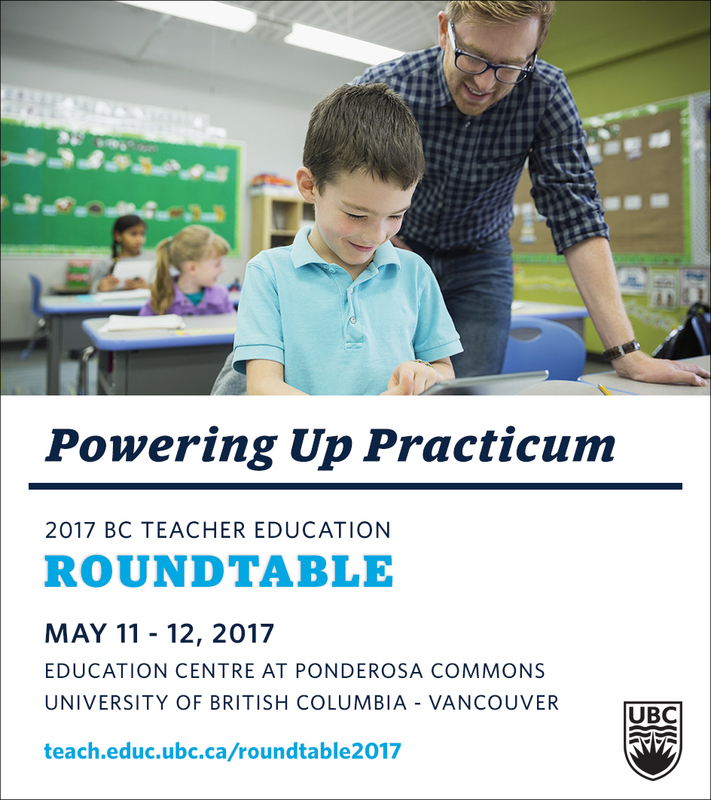 The Faculty of Education is pleased to welcome educators and administrators from across the province to the 2017 BC Teacher Education Roundtable conference. 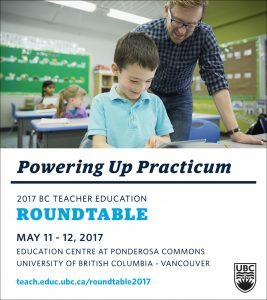 This year’s theme is Powering Up Practicum.